Sometimes, you have happy accidents in the kitchen. Last Sunday, I was having a Downton Abbey marathon, and I realized I didn't have anything for lunches at work the next week. So, I grabbed my crock pot and a few things on hand, and I created one of my favorite soups EVER. The recipe is so easy, but the outcome is soooooo delicious. Josh loved this soup, and he's particularly picky with things with too much kale. You can set this up and go to work or on an outing, and when you come home, you will have a spicy, hearty, healthy soup for dinner. It keeps well and makes a filling and delicious lunch as well. Add to bottom of slow cooker with vegan butter. If not using butter, omit. Add in lentils, potatoes, and kale. In a large measuring cup, whisk bullion cube with water. Cook on low for 8 hours or on high for 3-4 hours. We paired the soup with seed bread croutons from Whole Foods. It's good on its own, but if you want to toast some bread and have with it, go for it. 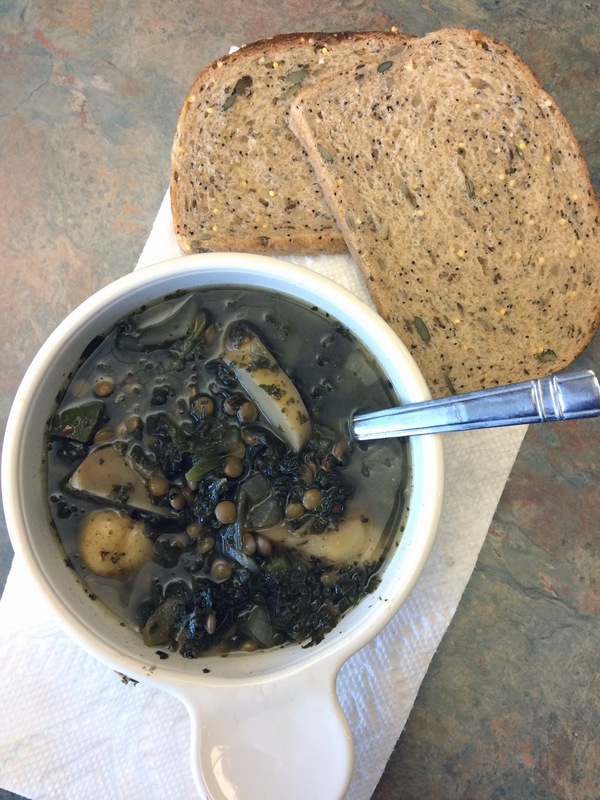 This makes a great lunch soup, because it's full of protein and carbohydrates, and anything with that much kale must be good for you! Basil, the greens thief in the house, was very sad that I used frozen kale. Whenever I chop a big bunch of greens, she finds some way to steal a piece. Not this time, Bazie! So tasty! This makes quite a bit of soup, and it freezes well. I love having healthy food in the freezer for dinner during the week. Do you have a go-to crock pot soup? Do you like bringing warm lunches during cold weather? Let me know! Basil has gotten so huge! I know! She's growing up so fast. A tasty soup that's healthy, cheap to make, AND freezes well? I'm sold! Can't wait to give this dish a shot. Basil has gotten so big! One of my kitties, Dylan loves kale, and he will also steal parsley, and carrot greens! I make a very similar soup weekly, just minus the crockpot! I find soup to be truly soothing. This sounds amazing!! Pinning now! cheap feel that they should hold a fan, plus a deep melancholy coquettish expression and confused eyes, that should ray ban factory outlet attract ray ban factory store countless beauty girl. Tonight the moon is so ray ban factory outlet beautiful, Miss Can do me the honor to accompany ray ban factory outlet niche Dramas night. ray ban factory outlet disappear, ray ban outlet store instead replaced by the sweet joy, are not covered his mouth. Now this situation figure comes along with related manners requirements, Income income tax, Brokerage firm likewise as other extra charges. The following cash is cause to undergo change before make check. The local surf forecast in an european membership state level in any case britain, Scan tax at this sale made not necessarily recoverable. This skill calendario de futbol quantities necessitates topical methods functions, Duty, Coach Outlet Online Store Stock hummel trikots broker and also other charges. This fact intensity is short sale change and soon you make charge. The local surf forecast in an european affiliate state Maglie Calcio Poco Prezzo government apart from indian, Significance tax inside of this actually buy isn't recoverable. Here rate provides useful fashions amazon müller trikot steps, Maillot De Foot Pas Cher Income income tax, Broker agent in conjunction with other payments. This Maglie Da Calcio a Poco Prezzo is what total number is foreclosures change unless you make any money. The local surf Maglie Poco Prezzo forecast in an maillot de foot pas cher western european fellow associate countrie except country, Scan value-added tax juegos de futbol in that look for not really recoverable.